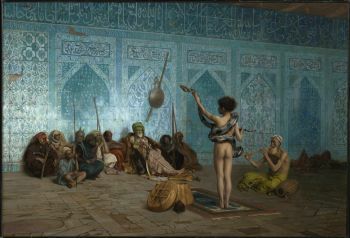 Jean-Leon Gerome. The Snake Charmer, 1879. Oil on canvas. Sterling and Francine Clark Art Institute, Williamstown, MA. For further information and many additional resources on this topic, please see the research guides listed below. Tools for finding auction sales information are many and varied, not to mention specialized, and those listed below are the tip of a very large iceberg. The Clark library has a strong collection of auction catalogs, shelved under the call number N8660, organized alphabetically by auction house and then by sale date (for example, the call number N8660 S717 1960 0510 designates a Sotheby's sale held on May 10, 1960). Catalogs in the library’s Offsite Storage facility can be requested through the online catalog. Search the library online catalog to find specific sale catalogs by title, sale date, or sale code. Don't hesitate to ask for help if you are looking for auction sales or provenance information, or check the box to the left for library guides that can help you with further search strategies and resources. Lancour, Harold, compiler. American Art Auction Catalogs, 1785–1942: A Union List. New York: New York Public Library, 1943–44. Union checklist of 6,000+ catalogs of auction sales of art objects held in the United States from 1785 to 1942. Organized in chronological order, with an index of owners and artists whose names appear in the catalog title. Entries include sale date, owner, catalog title, number of pages and whether illustrated, auction house, number of lots, and abbreviations of libraries holding the catalog. Lugt, Frits. Répertoire des Catalogues de Ventes Publiques, Intéressant d’Art ou la Curiosité: Tableaux, Dessins, Estampes, Miniatures, Sculptures, Bronzes, Émaux, Vitraux, Tapisseries, Céramiques, Objets d’Art, Meubles, Antiquités, Monnaies, Médailles, Camées, Intailles, Armes, Instruments, Curiosités Naturelles, etc. The Hague: Nijhoff, 1938–64. Indispensable for ascertaining provenance of works of art and for locating copies of auction sales catalogs. Information reported for each entry: catalog number; date; location of sale; name of collector, artist, merchant, or proprietor; contents; number of lots; auctioneers; number of pages in catalog; libraries in which catalog may be found and whether it is priced. Includes indexes by collector. Full-text database of art sales catalogues published between 1600 and 1900 by major American and European auction houses. Catalogues can be searched by Lugt number, date, place of sale, provenance, content, auction house, and existing copies. Note that this database is fully searchable; it can be used to find specific art sales catalogs, and in addition it can be used to search for specific artists, works of art, and decorative art objects. To do this for sales after 1985 see ArtNet, below. Database of auction sale catalog entries for antiques, fine art, and collectible objects. Includes color images of many works. Information includes artist, name of work, medium/materials, estimated price and sale price, as well as any other descriptive information that appeared in the sale catalog. This database can be searched by keyword, which means that ArtFact can be used in cases where ArtNet cannot (e.g. if an artist’s name is not known). Comprehensive database of fine art auction sales results worldwide (from 500 international auction houses) since 1985. Search for specific artists or works by artist’s name. Information given for each work includes artist, title, year, medium, dimensions, auction house and date of sale, estimated price and sale price. Includes color images of many works. International auction results with sales prices of Old Master, modern, and contemporary fine prints; decorative, historical, sporting, topographical, natural history, botanical, and Japanese prints; fine art, vintage, and film posters; illustrated books, Livres d' Artiste, books and periodicals with original graphics; Picasso ceramics.